Seeing a Stanhopea in flower for the first time was an unforgettable experience for me. The plant was growing on a bench in our greenhouse and had sent its long spike down through the potting mix and the bench mesh so that the flowers opened below the bench. The flowers were enormous and birdlike. They had glossy black eyespots. And the fragrance was vanilla creme icing. It was sublime. One by one, our Conservatory staff crawled on hands and knees under the bench for a closer look. But I felt a growing sense of unease looking at those flowers. After everyone else had left the room I turned to my boss, Ron Determann, and pointed to the confusing configuration of flower parts. Which are the petals? Et voilà. 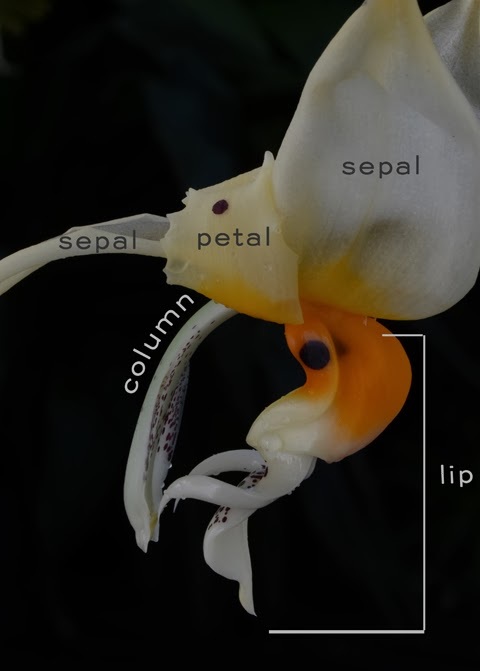 If you were to hold a Stanhopea bud and peel back the successive layers like an onion, the uppermost layer would be the sepals. Orchids have three sepals. In primitive flowering plants the sepals are drab and leafy and their purpose is to protect the inner layers from hungry beetles. In Stanhopea, a relatively advanced flower, the sepals are showy and attractive to pollinators. The next layer consists of three petals. In Stanhopea two petals are narrow strips reflexed backwards over the top of the sepals. The third petal is the lip. The trumpet lip of a Cattleya is iconic --it's what makes Cattleya instantly recognizable. But a Stanhopea lip with its horns and eyespots is even more interesting. Take a closer look at the lip. 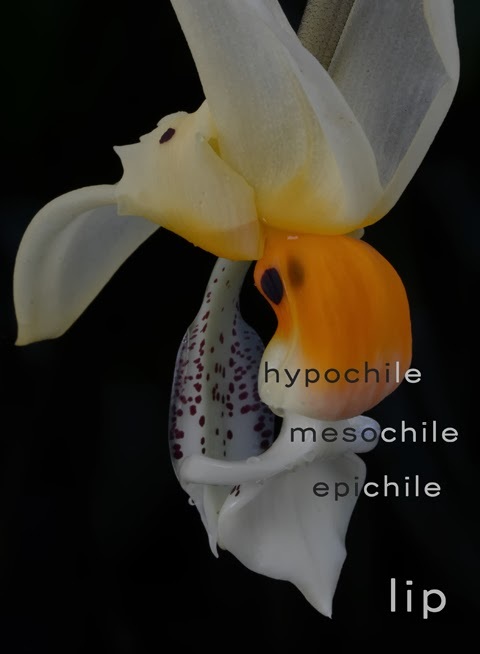 If you draw an imaginary line horizontally across its midsection, the basal part is the hypochile (hypo = below), the center of scent production, and the terminal part is the epichile (epi = above). 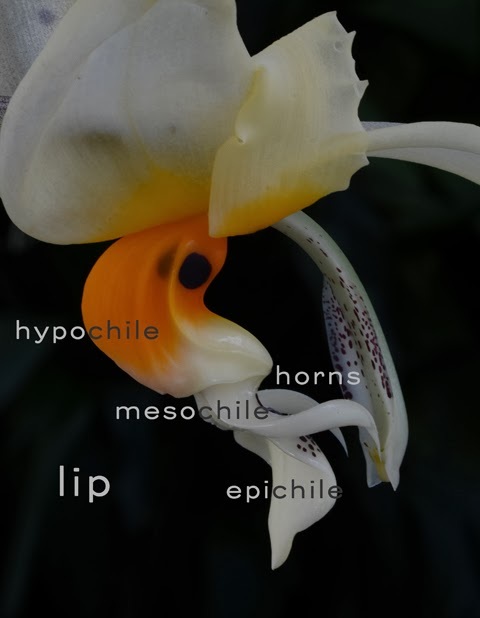 Two horns project from the midsection, the mesochile. The horns make sure that the bee is correctly positioned to receive the pollen. At the very center of the flower is the column. 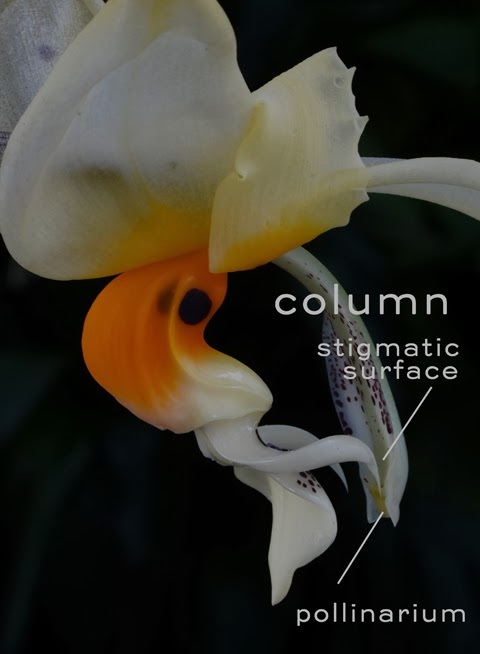 The column is one of the defining characteristics of the orchid family (and our blog's namesake!). It combines male and female parts into a single structure. 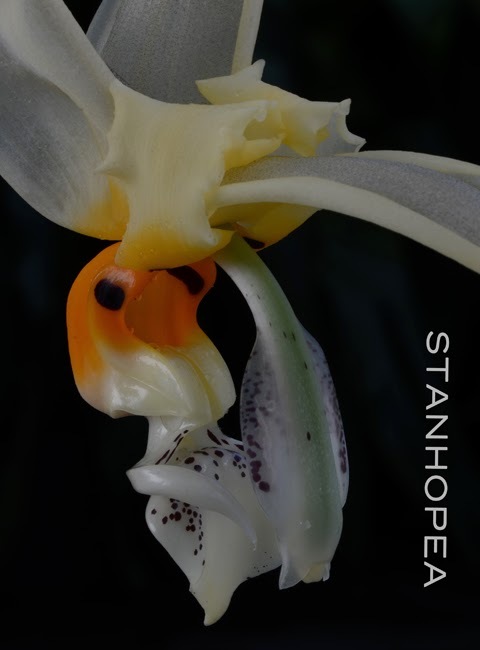 The stamens and pistils that you expect to find at the center of many flowering plants are absent in Stanhopea. Likewise the pollen grains. In Stanhopea the pollen is clustered into masses. Two pollen masses, or pollinia, are united at the end of a slender filament, or stipe, that has a large adhesive disk at its base. Perfect for attaching to a bee. The whole package, called the pollinarium, is tucked away under a cap at the end of the arching column. Just above the anther cap is the sticky stigmatic surface where incoming bees leave pollinaria from other Stanhopea plants.The pollen germinates on that surface, releasing sperm cells that travel the length of the column to the ovary (barely visible in the fourth photo) located above the sepals. After fertilization of the ovules the ovary swells and becomes the seed capsule. What a gorgeous flower. They look so complex that I am intimidated in attempting to grow a plant that produces such a masterpiece of a bloom. They do look intimidating, don't they? But we grow most of our Stanhopeas right alongside our Cattleyas in our intermediate temperature greenhouse (60º night minimum). They don't need anything special, other than an open weave basket that allows the pendant flower spike to emerge from they bottom.